An arbitrator determined the Bengals were within their rights to ask Eric Reid if he planned to kneel for the anthem. 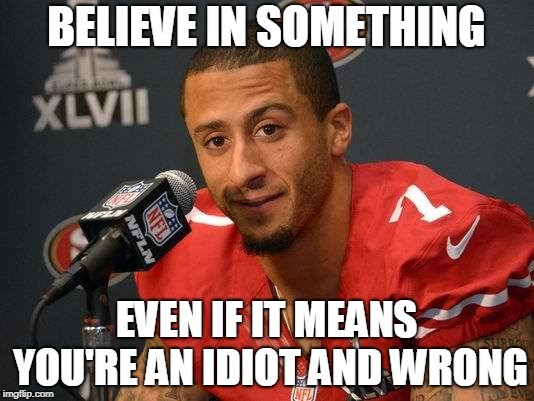 New York, NY – A teammate who helped Colin Kaepernick lead anti-police kneeling demonstrations as San Francisco 49ers has lost his case against the Cincinnati Bengals for asking him if he’d kneel if they hired him. An arbitrator ruled Tuesday that the Bengals had the right to ask National Football League (NFL) player Eric Reid if he planned to kneel during the playing of the National Anthem. TMZ reported that the Bengals met with Reid on April 9, at which time he was asked the question. Reid refused to answer the question and, consequently, was not signed by the Bengals, according to NFL.com. The National Football League Players Association (NFLPA) sued and claimed that the Bengals didn’t sign Reid because of the question about the National Anthem. The union argued that it was a precondition of employment and it violated the collective bargaining agreement, NFL.com reported. However, arbitrator Shyam Das determined the Bengals were well within their rights to ask Reid about his plans for future protests. After the kerfuffle with the Bengals, Reid was signed by the Carolina Panthers. He has knelt during the National Anthem so far this season. When the Panthers played the Philadelphia Eagles on Oct. 21, he got into a confrontation with Philadelphia’s Malcolm Jenkins prior to the coin toss related to the kneeling. In an altercation that was captured on video, the two players approached each other and exchanged words before they were separated by their teammates. Get your Warrior 12 Believe In Something hoodie, and show support for true heroes to actually sacrifice everything for what they believe in. Reid and Jenkins have been exchanging barbs since Jenkins co-founded the Players Coalition, and stopped kneeling during the National Anthem after the NFL promised to donate $100 million to causes important to the new organization, according to ESPN. Reid called Jenkins a sell out after Sunday’s game. "He co-opted with the movement that was started by Colin to get his organization started. It was cowardly. He sold us out," Reid said, according to ESPN. Kaepernick tweeted his support for Reid after the game. “Eric Reid!!! Enough said!! !” Kaepernick posted. NFL= No F'n Lowlifes welcome in my home or on my TV. Kaepernick's quoted reason for kneeling during the National Anthem: "I am not going to stand up to show pride in a flag for a country that oppresses black people and people of color. To me, this is bigger than football and it would be selfish on my part to look the other way. There are bodies in the street and people getting paid leave and getting away with murder." Kaepernick, like other common race hustlers such as Sharpton and Jesse Jackson, is only 1/1020 % correct. Make no mistake, his kneeling program is a protest against white police and white people. He brings no facts to the table because he has none that prove his point. While blacks are shooting blacks at an alarming rate in the United States, he has no solutions. The only thing he has to offer is cheap moans of racism which have long worn themselves out. People are becoming woke and are fed up with racist lies about blacks being oppressed and black criminals being shot by police just because they're black. Why do blacks turn their criminals into heroes? What positive message does Black Criminals Matter have for America? None. True the Bengals team did have the right to ask if Mr Reid was going to kneel. But Mr Reid HAS the right to kneel for the so called 'national anthem'. As I've said before, I don't stand for that song. Its not 'anti police' to me. Once I understood the lyrics and the racism within the song (read the lyrics that are not usually sung and you'll see) I said I'll never stand for the anthem ever again. It's been 15 years that I haven't stood and here's to more years of not standing. The guy's picture is priceless! Looks like he got a surprise enema!